Makeup | Skincare | Haircare | Reviews. 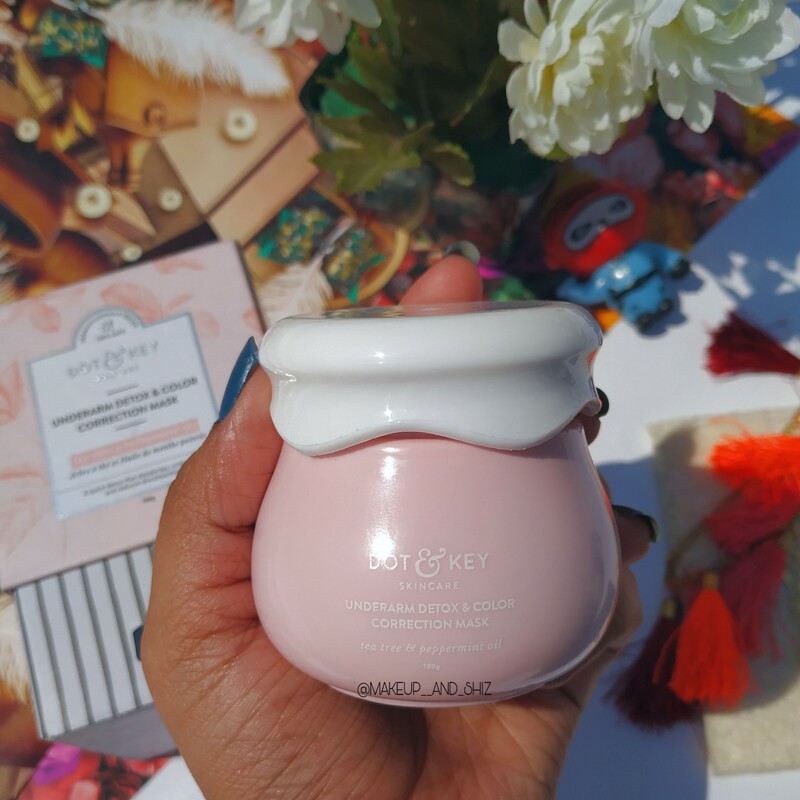 Dot and Key Underarm Detox & Color Correction Mask — Review. DOT and KEY is a new Indian Skincare brand which caters various range of the products. A few days ago, Dot & Key sent me their products . I will be reviewing the colour correction mask. Also available on Nykaa, Flipkart, Amazon & Purplle. There may be several reasons why underarms become darker and coarser with time, but there’s no reason that can’t be corrected. This detoxifying mask is specifically designed for tender underarm skin and eliminates pigmentation, discolouration and roughness of dark underarm skin. Formulated with activated charcoal, jojoba and tea tree oils, it pulls out those dark, dead skin cells, dry sweat and accumulated impurities to reveal the lighter underarm skin underneath. Its calcium-vitamin complex helps restore the natural even tone of skin, not just making it lighter, but smoother and softer as well. With no nasty chemicals, it is safe and gentle on skin, free of side effects. The zesty peppermint and tea tree oils it contains deodorize effectively, fighting body odour, leaving skin feeling fresher, for longer. This is a quick little detoxifying treat – one that your underarms thoroughly deserve. It comes in a cute outer covering which looks very luxurious. Once you open the outer packaging , you see the mask bottle inside. The cap in tightly placed. Apply a thick layer of the detox & skin lightening mask to underarm skin. Leave on for 20 minutes. Gently rinse with water and pat dry. Well, I have been using this for more than a month now. I can this mask has helped me make my underarm lot cleaner. After you apply this , this gives a instant cooling effect which I loved. The texture is that of a clay mask. It has a soothing smell due to tea tree and peppermint oil. Well , it is written to use it twice a week , but I have been using it thrice a week and it keeps my underarm lot cleaner . It has made my underarm softer than before. The skin feels more smooth and pigmentation are quite less. It has definitely reduced my dark underarms. It takes time but if you are consistent with your routine , you will see clear results. Also my underarm, sweat a lot less now. Cruelty Free, Dermatologist Tested and 100% Skin Safe. Also Read :Dot & Key Hand Cream Sanitizer+ Moisturizer – Mandarin & Lime — Review. Also Read :Dot and Key Underarm Colour Correction Serum– Review. Reduces pigmentation with constant use. That was all for this post! Have you tried Dot and Key products? If yes , comment down below and let me know. Next Nykaa Skin Secrets Sheet mask Black Mud+Aloe Vera — Review.